LG is not too successful with their Android Phones but they have a different lining of the Launcher and custom wallpapers that is loved by many peoples. 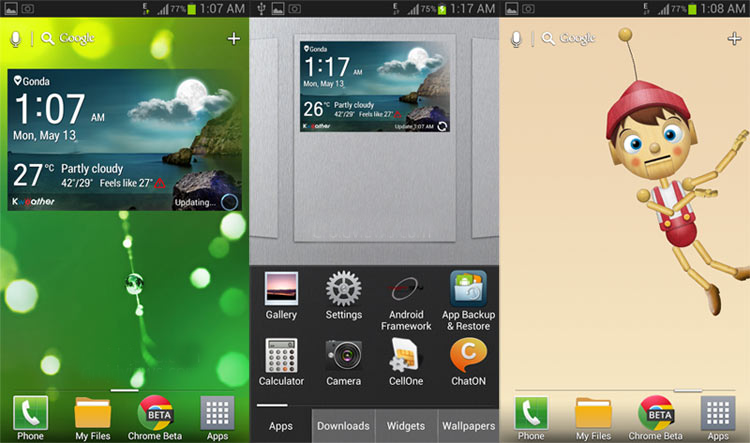 LG has recently launched Optimus G Pro, which features the newest LG User interface and Launcher. There are also many new Live wallpapers and Widgets that are attractive. If you have a Phone that is running on Android 4.1 Jelly Bean then you can experience the user interface by installing Optimus G Pro Launcher. XDA dev forum members have ripped the launcher, wallpaper and widget and made it available as .apk files that can be easily installed on any ICS or Jelly Bean Android phone. (Inside the weather folder, you’ll see a file “WeatherMultiCPbin.apk”. Copy this to “system/app” directory using root browser. The main weather app can be installed normally). I would like to remind that your Phone must be running the latest Ice Cream Sandwich or Jelly Bean Android version. If you are on an old version then you can update using the latest firmware release or a custom ROM available specifically for your device. It is also suggested that your Phone must be rooted so that you can root browser for the operation mentioned in the download section. You are done, enjoy the Optimus G Pro Launcher with LGUI 4.0. You will also like the wallpaper and widget designs. Let us know if you face any problem.